English School Los Olivos is a co-educational day school, for both Spanish and non-Spanish pupils. It was originally founded in 1976 by a small group of Spanish and English-speaking teachers as a bi-lingual Nursery School. The school now offers a full British curriculum, complemented by Spanish Language and Social Studies and Valencian studies, to children from 3 to 18 years of age. The school attempts to set new goals within its own educational horizons, linking the enrichment of learning a new language and culture with an educational philosophy that stresses responsibility, dialogue and mutual respect. The school is run as a co-operative of teachers. all members of which work on the school staff, including British. American and Spanish nationalities. All the teachers are fully qualified in their respective areas. The school also has a full-time educational psychologist and the services of a doctor. Of a total of approximately 380 pupils, the large majority are from Spanish families in the area. However, from the age of 5, adequate knowledge of English for the corresponding age group is required for admission. The school is a recognised examination centre, enabling the students to take G.C.S.E’s and I.G.C.S.E’s at 16 and A2 and AS in Years 12 and 13. We also offer the possibility of students taking the Certificate of Proficiency in English. Students are also prepared for Spanish University Entrance Examinations. 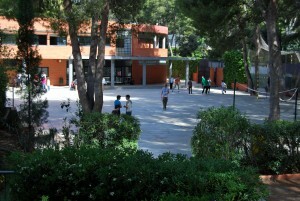 The school is situated in a quiet, residential area about 8 kilometres from Valencia. which is well communicated with the centre of the city and the surrounding area by the Ademuz Motor way and the Valencia by-pass. School transport is provided for students both from the city. The school is housed in purpose-built premises to which a new wing of classrooms was added in 1984. Facilities include a libraries, science laboratories, IT room, music and art rooms, sports and gymnastics areas, dining-rooms and well-equipped kitchens. The school day is from 9 am to 4.30 pm, Mondays to Fridays. The school year is from mid-September to the end of June, respecting the calendar for all schools in Valencia. Outings and educational visits are organised at regular intervals throughout the school year, including a week’s camping trip in the Spring. The school celebrates several English and Spanish festivals, especially Halloween, Christmas, the local Fallas and a Summer Fair. A wide range of extra-curricular activities are offered. In July a month’s intensive English course and a programme of leisure activities are also offered.